Europe continues to be the source of the best-appreciated products in terms of quality and innovation, and of trends that exert a global influence. D.B. Group supports the sharing of this value. D.B. Group’s headquarters are in Italy but our integrated logistics extend throughout Europe. 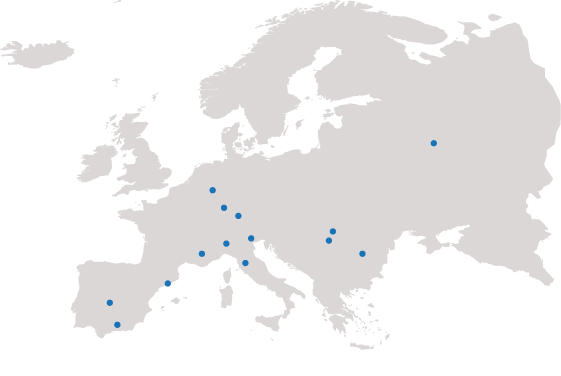 We are proud of our presence in prime locations around continental Europe, with offices in Romania, France, Spain, Germany and Russia. Italian products are greatly valued worldwide for their quality, attention to detail and innovative design, the result of inimitable craft skills, culture and expertize. We have always supported the exporting of this excellence to the rest of the world. Romania has played a key role over the last decade as an area for delocalization and supply for Italian companies. By now, Romania has developed into a strategic platform for business between markets of the East and West. The French economy is currently improving in all the main parameters: GDP, internal demand and private investments are all on the rise, thus providing a positive climate for the business world involved in transalpine exchanges. A country widely admired for its liberalization process and oppennes to international markets - particularly during the economic boom at the beginning of this century – today Spain is regaining confidence and capacity to grow. It is undoubtedly poised to become one of the main players on the European scene in the short term. Despite the unstable international situation, Germany’s economy continues to grow steadily, as was borne out by the figures for 2015, which showed 1.7% growth and a budget surplus of 0.5% of GDP, the highest for the last four years. Russian consumers are confirmed as among the world’s top spenders for the luxury market with forecasts of a strong increase by 2020, particularly for medium-to-high priceband products in the lifestyle and technology markets. It is thus a key target for the high-end markets - fashion in particular - to be discovered with the support of D.B. Group.